Happy March 1st! I’m so ready for our dreary wet winter to end, but the sun is out today and it’s looking like Spring! 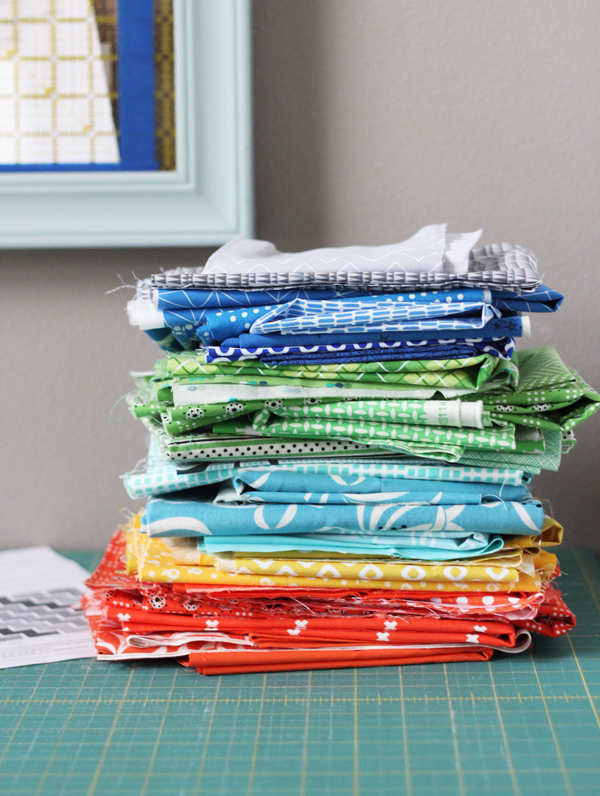 I pulled this happy stack a couple of weeks ago and decided to make another Ziggy Baby quilt but with lots of different prints for each color. The pattern really only used 5 fabrics, but I wanted each “step” to be a different color with lots of different fabrics. I colored in the layout diagram how I wanted it, and then cut the fabrics from my stash until I had enough I needed for each row. It only took me 3 failed attempts to lay it out without the pattern before I went and got the layout diagram…it’s looks deceivingly easy out until you get started! I love the result, and it’s nice and big measuring 48″ x 54″. The pattern can be found here (or the paper pattern here), it’s a beginner friendly pattern for sure. 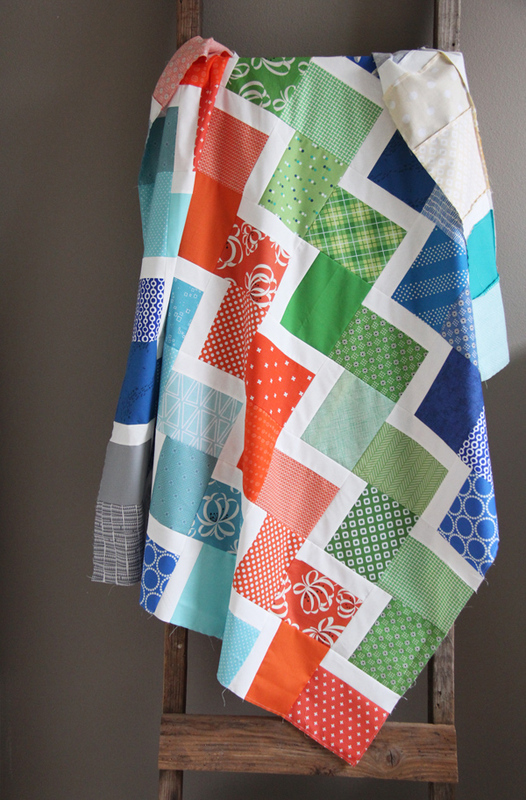 If you are a seasoned quilter this is a great quilt to even make without a pattern! I planned on giving this to a sweet lady at my church who is having her tenth (!) baby next month…but I barely know her. Is it weird to give someone I barely know a quilt? I’m just going to do it anyways, and who cares if it’s weird right? I’ll be that awesome/weird lady at church who gives everyone quilts. Do it! She’ll love the colors and that you thought of her! With her tenth child, I bet she doesn’t have a whole lot of new, fresh items for her baby. She will be very happy and appreciative! And, “No”, you’re not weird, just thoughtful! Cheers to you!! That’s so true….maybe it will be a fun “new” thing! you should totally be that lady. I gave one to someone I was on jury duty with. but maybe we had bonded by the end of the week? Don’t worry about it; just do it! I gave one to the guy who came to install our new satellite. He just mentioned that they were adopting a baby. He was kinda shocked but thankful. That’s so funny!! I love that you gave him a quilt! “Never suppress a generous thought.” Right?! I think that’s a sweet idea; Go for it! Oh there is weird and weird… I think it is a very lovely gesture to give her a quilt. Ten babies my goodness. LOL I’ve just adopted that title from now on! How sweet of you! Lovely fabric combo! Love your new Ziggy quilt, so fresh looking. Give your quilt the the lady with 10 children, she will love the surprises besides any woman with 10 children needs a sweet gesture like that. My granddaughter has nine children and no signs of stopping, she is a wonderful mother. Cute quilt! I’d give it. My 28 year old single daughter lives in Alabama and when she tells me a co-worker had a baby, I send a quilt to her to gift. It’s not weird at all. People are always thrilled with the quilts. Yes; give her the quilt. Someone gave me a quilt 10 years ago when I was quite ill. I use that quilt every night and feel so much love. Quilts say love. That’s a good thing! That’s a lovely quilt! I think it would be really nice and thoughtful to give it to the woman at your church, I’m sure she would appreciate it! It’s a cute quilt and your are not weird. You are being very thoughtful and caring. So cute! Give her the quilt–baby #10 should have something new to enjoy. =) Plus, you never know how it might bless someone. I made a baby quilt with leftovers from another project that turned out so cute—I decided to give it to a family in our church having their first daughter. I only knew them slightly, but the Mom loved it so much; she still comes up to me and tells me how much she enjoys having a handmade item for her daughter. I love the quilt. Give her the quilt—spread goodness around. I have a question. Do you have a favorite thread? Or, have you previously done a thread post? I usually use Aurifil 50wt. and I think the color is 2200? Or whatever just the plain white color is. :) It works the best in my machine and disappears for quilting. Well, good for you. Because even though some people will be thinking, “Oh, #10, what is there to be excited about?”, to that family, each baby is a lovely, thrilling new addition. And every baby deserves something new and all its own. Yes yes yes…love this thought!!! Absolutely go for it! It’s not weird, it is a wonderful generous thing to do! I think it’s a great idea to give it to the woman at church. I concur with the other comments, that by the time you get to 10, you probably aren’t going to get a lot of new things for the new baby. And even if people think it’s weird, it’s a really nice weird! What a nice idea! I’d love to make that quilt for a boy. Always on the lookout for boy quilts,,, I had 7 children, and Im kind of weird. I got pretty much bought all new for every baby. A fresh precious baby needs fresh new stuff….and each one got a quilt I made. I was a total baby lover and still am…. Everybody knows that Weird is just a byproduct of Awesomeness. That may just be my new life mantra! Well said. Yes indeed. Without a second thought Allison. Be weird. I think there are a lot more of us weirdos out and about. It’s so pretty and bright! I’m sure it will totally brighten her day! How sweet! How nice for a tenth baby to get something new! I think you are very dear to make this baby its own quilt. And it’s so bright & wonderful! That whale print is so fun! And I think it’s not weird. When I had my twins almost 18 months ago (they get to go to nursery in THREE sundays, I can’t wait! ), someone gave us matching flannel receiving blankets anonymously through the RS president. I have no idea who it was, but it was thoughtful and sweet. I wish I did know! And since I’m sure everyone knows you’re a quilter, it wouldn’t be a mystery for long, so no need to worry about secrecy. I think most moms love to be remembered. 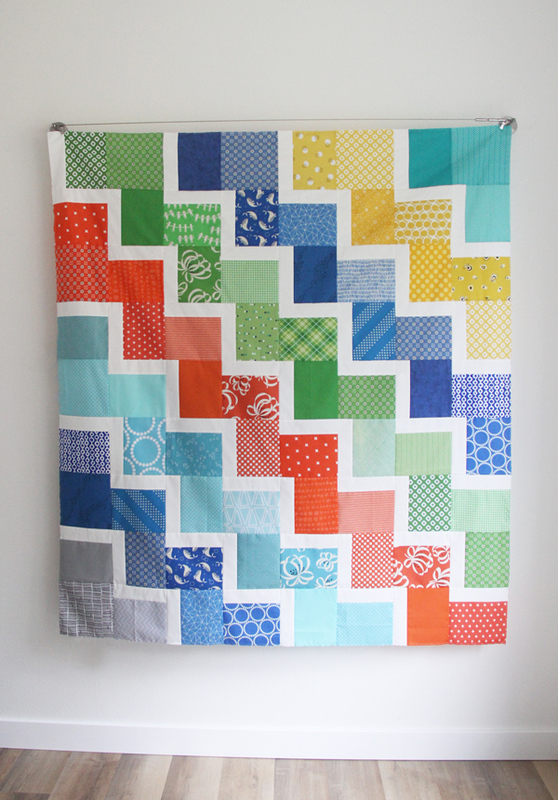 And if anyone deserves a baby quilt, it’s a tenth baby. Wow! Such a great gift! She will love and cherish this wonderful quilt for her 10th child!! do it – what a splendid gift for a 10! baby. What a great, thoughtful idea! I bet you’ll make anew friend. So pretty!!! 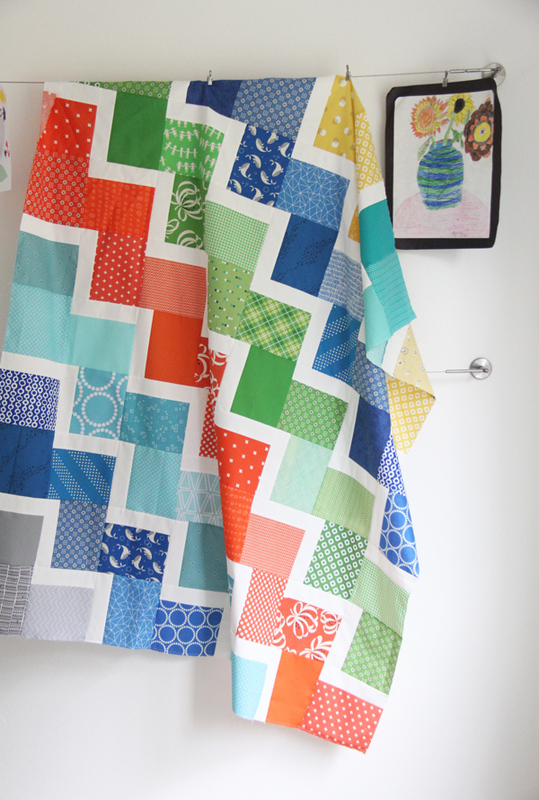 The pattern says it makes a smaller quilt than the adorable scrappy one pictured. How can it be made bigger? I want to make! P.S. I’m having a baby in September!!! Well, you may think you’re weird, but I think you are adorable. I’m, 76 and I think I’m still only 45, but my body sort of creeks and groans. It’s wonderful to see your sweet Baby Jane and your boy and girl who are so in love with her, and your husband’s face as he looks into her eyes. We have a beautiful new great grandbaby girl, Blakeley Rose. She is the sweetest, quietest baby girl. We go over to their house just to look at her. She’s our fifth great grandbaby, bit you’d think she was our first. She’s just three weeks old, and we’ve been to visit her three times. I’d go every day if I thought it wouldn’t be too much. Isn’t God so beautiful? And you are beautiful too. You just go ahead and give your precious quilts to whomever you like. In so doing, you are giving the Lord’s love. Today, after Church,, I’ve just been sleepily scrolling through your blog and it blessed me. I’ve sent a little prayer up for your sweet family, and your blog. You are bringing glory to our good God by telling your story. You’ve been a blessing to me today. Sweet Girl, keep on reaching our to everyone with your love. PS What is the http://gravatar.jackinka331 about?? Hi Allison, I purchased the Ziggy Baby Quilt, and I’ve been trying to find out more information and I can’t find anything. Am I looking in the right place. 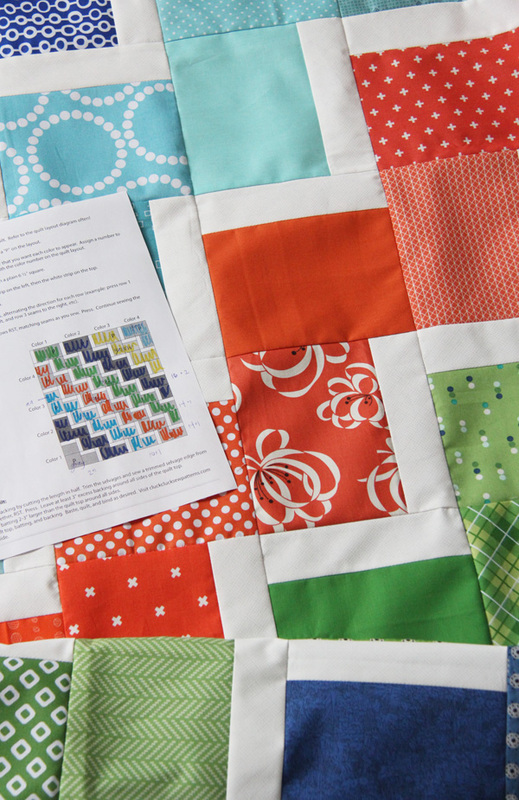 Would you please email me and let me know what is available as a support for your quilt pattern – jackinka331@gmail.com?. Oh that’s so fun Helen! Thanks for sharing this! Hope you are doing well! Awesome-Yes! Weird-Not in the least. Love the pattern. Lucky people to have you in their church. By the way, saw a picture of Wilson. What a beautiful cat, looks like he’s well groomed.